(China Aid) — Henan authorities continue tearing down crosses in Zhengzhou, Nanyang, and Yuzhou. Christians of Chinese Gospel Fellowship Tongxin Church located in Anpeng, Nanyang sang hymns to encourage each other in their empty church after the cross was demolished. It is unprecedented that Henan officials massively destroy crosses. Eight house churches were shut down in the Jinshui District of Zhengzhou alone. Local Christians said that it was hard to estimate how many churches were closed. 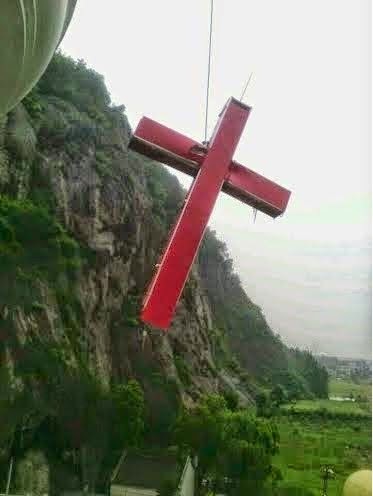 According to a Christian from Zhongmo County, local government informed each church about taking down the cross, but nobody responded to it. Some churches were afraid the government would demolish the cross, so they intended to cover it with black veil to conceal it.